As the launch of Intel’s 8th gen processors for desktops draws near, more information is emerging about its new-gen processors, which are rumoured to be hitting shelves early next month. Leaked benchmarks also show that the new models will be outperforming the old i5s and i7s by quite a margin, and therefore could be a very desirable purchase for those who are still running old processors like that much-loved workhorse, the i5-2500K. And Intel’s new desktop line-up is not only looking like it will deliver world-class performance, but also appear to be shipping at a price that could make some think twice before going for an AMD Ryzen CPU instead. Actually, leaked processor prices which are doing the rounds online suggest Intel’s 8th gen could not only amaze when it comes to performance, but also price. As reported on Forbes, Intel’s top of the range Core i7-8700K will be going for $420 US dollars, while other models like the Core i3-8350K and Core i5-8400 will be shipping at about $199 and $230 respectively (note the latter price is obtained by converting from euros to dollars from the prices listed in the table below). 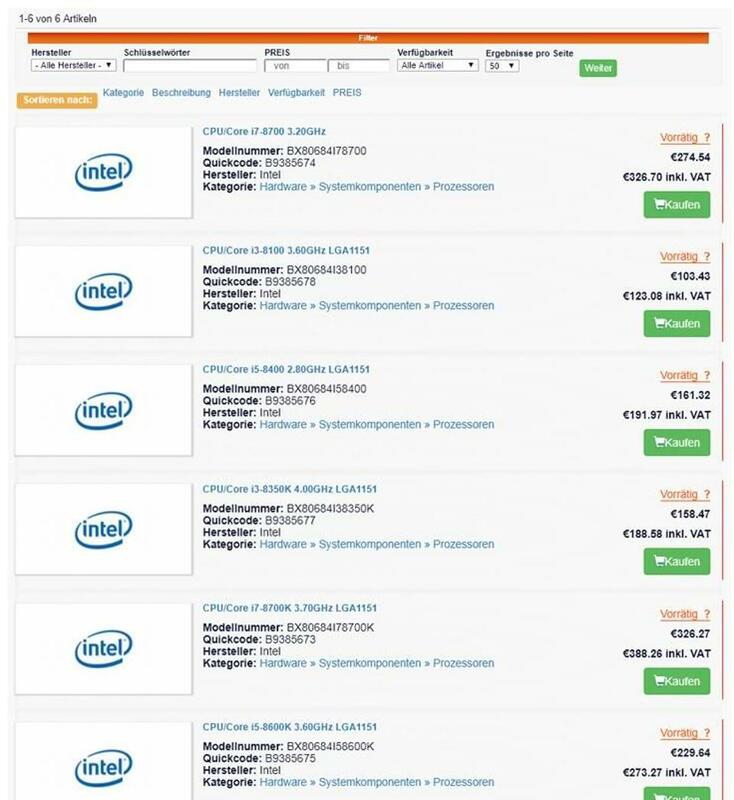 A German website has listed EU prices for Intel’s 8th gen processors (Guru3D). This means that the Core i3-8350K, which is not so far away from the i5-7600K when it comes to performance, could be an attractive alternative to the Ryzen 5 1500X and Ryzen 5 1400, for instance. The Core i3-8350K is also the first i3 to come with four cores, while the lower end i3-8100 and i3-8300 (which will likely be priced between $130 and $175 US dollars) also feature four cores and will be challenging AMD’s Ryzen 3 in the budget segment of the market. Meanwhile, the six-core i5-8400, which is expected to retail for $230 US dollars, is likely to outperform the Ryzen 5 1600 (despite the latter supporting twice the number of threads), making it a better gaming processor than its AMD competitor. There’s also the new i5-8600K, which will be dearer than the old i5-7600K at launch ($300 vs $240 US dollars) but will make up for it with a healthy increase in performance. At the high end of the market, Intel’s new Core i7-8700K (expected to ship at $420) will be taking on AMD’s Ryzen 7 1800X (which retails for $430), and shouldn’t be lagging behind much when it comes to gaming performance despite the fact that Intel’s is a 6 core / 12 thread processor and AMD’s an 8 core / 16 thread CPU. Overall, then, Intel’s 8th gen processors won’t be shipping at much higher prices than their earlier 7th gen, if these leaked prices are to be believed. Either way, it’s clear the Intel faithful have been waiting for the blue-chip giant’s response to AMD’s Ryzen threat for a while now, and it sure looks like the Santa Clara company will be delivering the biggest increase in desktop processor performance in a decade at a pretty decent price when its 8th gen processors ship early next month.